The post-orogenic terrestrial accumulations of Dupitila Formation (Mio-Pliocene) have been studied for the first time in the Cachar Thrust Fold Belt of Northeast India employing facies and architectural element analysis techniques. Six litho-columns measuring 85 m in thickness were analyzed at the outcrop level with minimum resolutions of 20–30 cm. Seven lithofacies, namely clast-supported horizontally stratified gravel (Gh), matrix-supported planar cross-bedded gravel (Gp), trough cross-bedded sandstone (St), planar cross-bedded sandstone (Sp), horizontally bedded sandstone (Sh), laminated sand–silt–mud (Fl) and massive mud (Fm), were identified. The two lithofacies assemblages, i.e., interbedded gravel–sand and sand–mud associations, characterize the lower and upper divisions of Dupitila Formation, respectively. Identification of five architectural elements, i.e., channel fill complex (CHm), single channel (CHs), gravel bar and bedform (GB), sand bed form (SB) and floodplain fines (FF), was accomplished through lithofacies distribution and arrangement of bounding surfaces. Alternating gravelly and sandy facies succeeded by floodplain fines present an overall thinning and fining upward cycle resembling the gravelly and sandy braided fluvial stream deposits. A semi-humid climatic condition has been envisaged for the formation of lithic to sub-lithic (Q66 F9 R25) Dupitila sandstone. These deposits have suffered early as well as late-stage diagenetic changes. The diversified detritus delivery to the fluviatile Dupitila basin was largely made by a recycled orogen comprising of Shillong massif, eastern Himalaya and the Indo-Burman Range. The Mio-Pliocene Dupitila Formation with its type area in the Dupitila Hill Range, Jaintiapur, Sylhet, Bangladesh, is a well-known aquifer bearing lithostratigraphic unit in Bengal basin and Assam. 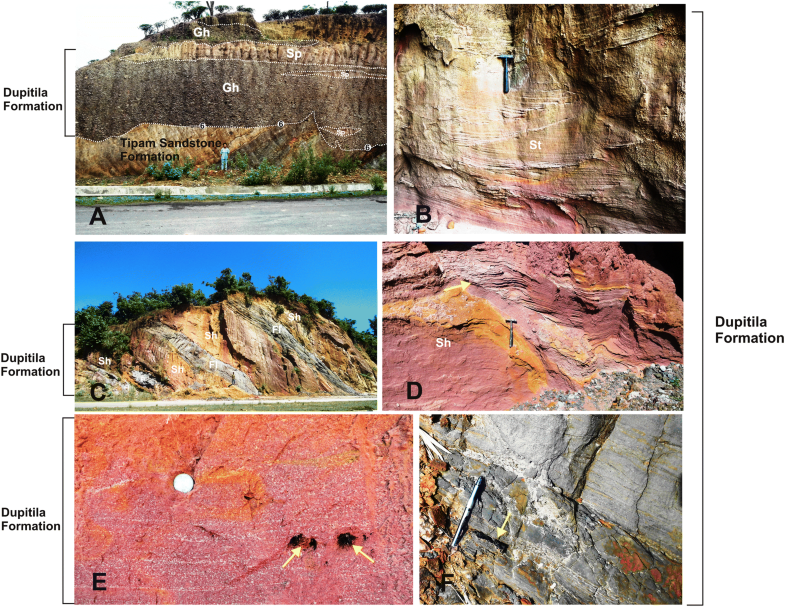 In past two decades, good numbers of sedimentological works were published on Dupitila Formation from Bangladesh [2, 55, 56] leaving Indian counterpart poorly documented notwithstanding excellent outcrops. Evans , Mathur and Evans , Nandy [46, 47] and Das Gupta and Biswas  provided preliminary reports on the lithostratigraphy and structure of Assam and the adjoining region. This study presents firsthand information on lithofacies architecture and analyzes tectonic provenance for the Mio-Pliocene Dupitila Formation in the Cachar Thrust Fold Belt (CTFB), Northeast India. The value of facies analysis lies in dividing sedimentary litho-units into genetically related packets based on hierarchically arranged bounding surfaces . Miall  in a similar attempt evolved an effective method of facies analysis and classification widely known as “architectural element analysis”. In recent years, Fielding , Hjellbakk , Friend et al. , Nichols and Fisher , Ghazi and Mountney , Tedesco et al. , Notebaert et al. , McGlue et al. 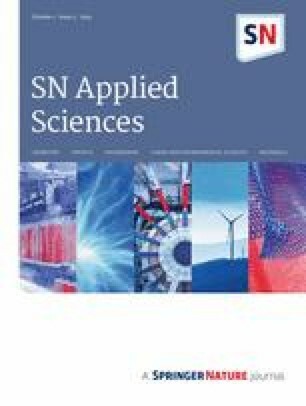 , Ghinassi et al. and Wanas and Soliman  have successfully accomplished the braided as well as meandering fluvial models using the facies and architectural analyses technique. Nevertheless, workers like [9, 22, 70] while dealing with the modal as well as chemical compositions succeeded in predicting the tectonic provenance of fluvial sediments. 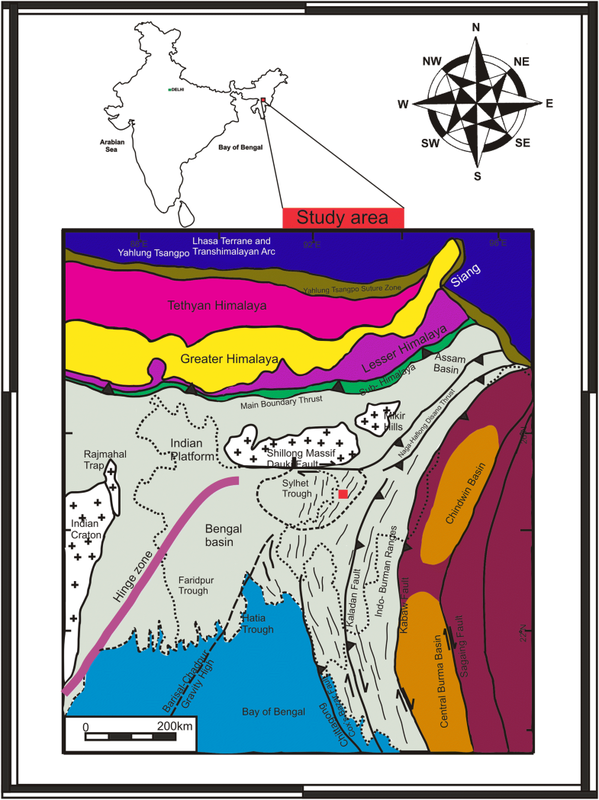 Occupying the northeastern corner of India in between the eastern Himalaya to the North and the Indo-Burman Range (IBR) to the East, the Cachar Thrust Fold Belt (CTFB) (Fig. 1) represents the frontal fold belt of a poly-history sedimentary basin named Assam-Arakan basin . The belt comprises of thick pile (10–11 km) of sedimentary deposit manifested into a series of NNE–SSW trending, sub-parallel, doubly plunging and highly faulted anticlines and synclines. Major rivers like Barak together with lower-order drainages define a trellis pattern under the influence of alternating synclines and anticlines . The CTFB is bounded on the north by the E–W trending Dauki fault which is assumed to be a thrust associated with right lateral displacement [5, 30, 34]. Eastward of it, the Naga-Disang Thrust System of Naga Hills separates the CTFB from the Schuppen belt of the Assam Shelf and subsequently intersects with Dauki fault. The eastern extremity of the CTFB is believed to be delineated by the Kaladan fault. The Kaladan fault also defines the eastern limit of Surma sub-basin . A prominent NE–SW structural lineament named the Haili-Hakalula lineament (HHL) delimits the fold belt toward the northwest. As per Kunte , HHL is a major wrench fault parallel to the direction of drift of Indian Plate where the western block comprising the Sylhet trough is thought to have moved north past the CTFB. This lineament is also observed to join the Dauki fault northeastward, whereas southwestward it passes over the Barisal–Chandpur subsurface gravity high which is considered to be the manifestation of the continent–ocean crust boundary . The intensity of folding in the region increases from west to east  affecting the sequence of rocks ranging in age from upper Cretaceous through Cenozoic. The Mio-Pliocene Dupitila Formation overlies Tipam Group of rocks with pronounced angular unconformity near anticlines, but maintains conformity in synclines . The succession is unconformably followed by Plio-Pleistocene Dihing Group of rocks. A generalized lithostratigraphy of the region is presented in Table 1. Detailed field investigations were carried out along road cuttings to identify lithofacies and their associations based on lithology, texture, sedimentary structure, geometry, bed thickness and nature of contact. Grain size variations and other sedimentological attributes were represented in the graphic logs. A total of 06 (six) graphic logs (Fig. 2A–F) covering 85 m of the stratigraphic column were measured and described at minimum resolution of 20–30 cm. Nevertheless, analysis of field photographs and field tracing of individual strata to document lateral and vertical stacking patterns supplemented field interpretations. In addition, twenty-six representative rock samples were used in preparing thin sections at ONGC Regional Laboratory, Sivasagar, and examined for their modal composition and diagenetic features under the Leica DMLP POL microscope at the Department of Earth Science, Assam University, Silchar, following the method suggested by Dickinson [16, 18]. All together three outcrops locations were studied for measurement and recording of vertical profile sections (VPS) along National Highway 54 with a spacing of nearly 2 km in between. These east-facing outcrops expose nearly 35 m section of gravelly–sandy facies including the base. The first outcrop at N24°56′201″–E92°47′281″ is nearly 30 m long and 16 m thick. The section begins with 2.7-m-thick Tipam sandstone dipping 54° toward N155°. The Tipam rocks are overlain by horizontally bedded thick conglomeratic horizon measuring about 9 m followed by nearly 4.5-m-thick alternations of pink colored medium grained sandstone, thin pebbly beds and conglomerate (Fig. 2A). The second VPS which was measured at N24°55′293″– E92°47′529″ begins with 3.5-m-thick conglomeratic horizon showing intercalation of mudstone and sandstone. These conglomeratic horizons are overlain by nearly 2-m-thick planar cross-bedded pinkish colored sandstone which in turn is capped by 1.8-m-thick conglomeratic horizon (Fig. 2B). The outcrop here is 12 m long and 7.5 m thick. The third VPS was measured at N24°55′201″–E92°47′281″ (Fig. 2C). The outcrop is nearly 25 m long and 11.5 m thick. Here, the section begins with nearly 3-m-thick column of Girujan clay overlain by nearly 1-m planar cross-bedded pink colored sandstone showing scattered quartz pebble near the base. These sandstones are in turn capped by nearly 2.4-m-thick conglomeratic horizon containing rip-up clasts of Girujan clay. These crudely layered polymictic conglomerates also show imbricate structure and are overlain by alternating sandy and conglomeratic horizons. At this location, three outcrops were studied along National Highway 54 with a spacing of nearly 1–2 km in between. These east-facing outcrops expose nearly 50 m section of sand–mudstone facies. The first outcrop in this locality is about 23 m long and 11 m thick that exposes medium-to-coarse-grained trough and planar cross-bedded sandstones at N23°42′167″–E92°48′351″ (Fig. 2D). Sandstones display pinkish color and contain mud clasts along with pieces of coal. Intermittent coarse-grained intercalations are characterized by stacked channels reactivation surface. The second outcrop at N23°43′423″–E92°47′674″ is about 27 m long and 13 m thick (Fig. 2E). It is comprised of fine-to-coarse-grained laminated, horizontally bedded, trough and planar cross-bedded pink colored sandstone with mottled clay layers showing variable thickness ranging between 4 inch to 1 feet. The thickness of trough cross-sets varies between 0.2 and 0.7 m, whereas the planar cross-sets range between 0.4 and 0.6 m. Syn-sedimentary deformations especially the load structures are quite common along the junction between clay beds and overlying coarse-grained sandstones. At places, syn-sedimentary faults were also observed. The presence of mud clast and clay lining imparts dirty flesh color to sandstone. Zones of iron incrustations were also observed in pink colored sandstones. These sandstones also contain pieces of coal and sometimes possess paper thin laminations. The pink sandstone occasionally exhibits limonitic color possibly due to differential weathering. The third outcrop at N24°54′974″–E92°51′053″ is nearly 28 m long and 13 m thick (Fig. 2F). Here, the VPS is characterized by pink colored, medium-to-coarse-grained, laminated as well as horizontally bedded sandstone containing lenticular bodies of granular to pebbly carbonaceous siltstone. At places, coaly streaks and coal clasts were also observed in the carbonaceous siltstone. This lithofacies is dominantly comprised of moderately sorted clast-supported polymictic conglomerate possessing crude horizontal stratification and imbricate structure. The paleocurrent direction ranges between N 280° and N 300°, the average being N 290°. Facies thickness varies from 3.9 to 11 m typically resembling sheet geometry. In general, this lithofacies exhibits a fining upward trend with an erosional base often containing rip-up clasts of Tipam sandstone/Girujan clay. On an average, it constitutes 78.57 percent of the total sections measured for conglomerate. It is well developed in Doloo tea estate where it attains a thickness of nearly five meters (Fig. 4A). This lithofacies is closely associated with Gp and Sp (Figs. 3C, 4A) with occasional intercalation of Fm (Fig. 3D) facies. The dominance of organized fabric, moderately sorted nature of gravel and the presence of erosional surfaces with rip-up clasts all point toward high-energy tractional processes influenced by stream flows in low-sinuosity, gravel-dominated channels in which transportation occurred largely by bed load and deposition occurred under waning flow conditions. This lithofacies is comprised of moderately sorted matrix-supported polymictic conglomerate possessing planar cross-bedding. Pebble imbrications and textural variations within cross-bed sets are not very uncommon. The average paleocurrent direction is N 280°. It possesses a wedge-like geometry, the variation in facies thickness being 1–2 m. Laterally, this facies passes into Sp and displays a fining upward trend with an erosional base. On an average, it constitutes 29.12 percent of the total sections measured for conglomerate. This lithofacies is closely associated with Gh and Sp facies showing spectacular development in the Doloo tea estate (Fig. 3C). The textural variations within the cross-sets and its lateral passage into Sp may be attributed to high degree of hydraulic fluctuations leading to gravel-clast over passing. This lithofacies is characterized by pinkish color, fine-to-medium grained trough cross-bedded sandstone containing minor interbands of clay. At places, pinkish color turns into grayish brown owing to substantial mixing of clay into the sandstone. Sporadic occurrence of coal clasts along with mud clasts is not very uncommon. Thickness of trough cross-sets varies between 0.2 and 0.7 m. The presence of iron incrustations along the bed tops is remarkable. The paleocurrent direction ranges between N 280˚ and N 300˚, the average being 290˚. Facies thickness varies from 3 to 5 m typically resembling wedge geometry. In general, this lithofacies exhibits a fining upward trend with an erosional base and a flat top. On an average, it constitutes 47.01 percent of the total sections measured for sandstone. This facies frequently occurs in association with Fm and Sp facies and shows maximum development in the section measured at N 24°43ʹ423ʺ–E 92°47ʹ674ʺ (Fig. 4B). The presence of scoured surfaces at the base of the trough in conjugation with minor pebbles and poorly sorted sand lag containing mud intraclasts are indicative of erosional relationship to the bottom. The trough thickness of 0.2–0.7 m may be attributed to the possible migration of 3 D dunes under relatively greater water depths. This facies is relatively coarser grained than the trough cross-bedded sandstone (St) facies and shows well-preserved planar cross-bedding where the cross-set thickness varies between 0.4 and 0.6 m and can be traced across the exposures. The fore-set beds are typically dipping at about 20° with sharp and angular upper and lower terminations. The upper and lower bounding surfaces are flat with no visible evidence of scouring. This facies often shows close associations with Gh, Gp, St and Fm facies. Modified cross-beddings showing hybrid character and approaching plane beds were also observed. Intraclast occurrences of horizontally bedded sandstone facies (Sh) within this lithofacies are a conspicuous feature. Facies thickness varies from 2.5 to 5.3 m typically resembling wedge geometry. On an average, it constitutes 29.37 percent of the total sections measured for sandstone. This facies is well developed (Fig. 3A) in the road section at N 24°43ʹ423ʺ–E 92°47ʹ674ʺ. A cross-set thickness of 0.4–0.6 m together with medium-to-coarse-grained size and flat bounding surfaces may be attributed to 2-D migratory dunes . The sharp and angular upper and lower terminations may be indicative of sand avalanching on forests. The presence of hybrid cross-bedding and plane bed indicates modifications under different flow conditions. Their formation may be attributed to high flow velocity and subsequent development of curved toe-sets. Further, the presence of reactivation surface points toward successive erosion of upper dune surface and renewed sand deposition over it due to fall and rise of water level, respectively. This lithofacies exhibits fine-to-medium grained horizontally bedded pinkish sandstone showing clay interbands and paper thin laminations (Fig. 4D) at places. Plane lamination and parting lineation are characteristic to this facies. The thickness of the facies ranges between 4 and 15 m. The top and bottom of the facies exhibits flat and erosional contact, respectively. On an average, it constitutes 50.04 percent of the total sections measured for sandstone. This facies is often found in close association with Fl facies (Fig. 4C). Its occurrence as intraclast within planar cross-bedded sandstone facies is not very uncommon. It is well developed in the sections measured at N 24°54ʹ974ʺ–E 92°51ʹ053ʺ and N 24°43ʹ423ʺ–E 92°47ʹ674ʺ. The presence of plane lamination and parting lineation is indicative of upper plane bed conditions at the transition from subcritical to supercritical flow. Sporadic occurrence of coarser material within the facies may be attributed to rolling along in the sand traction carpet. This facies is characterized by interlamination of clay, silt and very fine-grained sandstone. Siltstone and sandstone exhibit small-scale ripple bedding. Undulating bedding, desiccation cracks, plant roots and coal streaks (Fig. 4F) are common features of this facies. Thickness of the facies ranges between 0.5 and 6 m. On an average, it constitutes 13.40 percent of the total sections measured for mudstone. This facies is commonly found in association with Sh facies (Fig. 4C). A well-developed section is measured at N 24°54ʹ974ʺ–E 92°51ʹ053ʺ where it attains a thickness of about 4 m.
Interlamination of clay, silt and very fine-grained sandstone is an indication of deposition from suspension as well as weak traction currents. Further, the presence of ripple bedding, desiccation cracks, plant roots and coal streaks favors overbank areas for the development of this facies. The thickness of this facies varies between 0.10 and 1 m. Carbonaceous streaks, plant rootlets and occasional presence of desiccation cracks are not very uncommon. The lower bounding surface of this facies usually confirms to the shape of underlying bedform. On an average, it constitutes 5.16 percent of the total sections measured for mudstone. This facies (Fig. 3D) is well developed in N 24°55ʹ293ʺ– E 92°47ʹ529ʺ where it attains a maximum thickness of about 0.25 m.
Occurrence of this facies as massive mudstones as well as mud drapes within Gh, St and Sp facies indicates deposition from standing pool of water possibly during low stage channel abandonment. Conformity of the lower bounding surface with the underlying bedform further substantiates the above view. Rust  considered this facies as a most distal representative of floodplain facies including deposition in floodplain ponds. 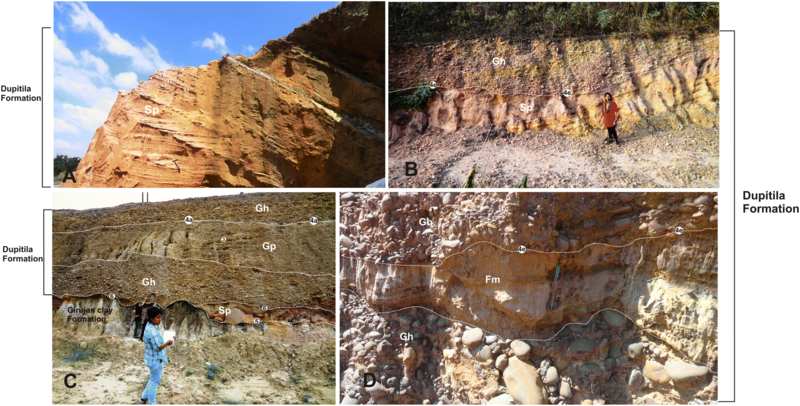 The Dupitila Formation in CTFB exhibits two distinct lithofacies associations that characterize the lower and upper Dupitila succession, i.e., interbedded gravel–sand and sand–mud associations, respectively. These facies associations resemble middle and lower parts of alluvial fan as described by Walker . The coarse-grained (gravel–sand) facies association is indicative of gravel braided streams (primarily gravel bars with some sand dunes), while sand–mud facies association depicts sandy braided streams (primarily sand dunes). The fine-grained facies association of upper Dupitila may be attributed either to distal fan or fluvial to swamp deposits that are laterally associated with distal fan . This is further substantiated by the presence of coaly streaks (Fig. 4F) and carbonized plant remains in fine-grained facies. The overall change in the grain size from north to south (i.e., toward Silchar town) is in good agreement with decreasing plunge of channel axes that may be related to downstream decrease in the river gradient. The channels in the study area exhibit relatively high slope. From base to top, the plunges of the axis at the channels decrease from 35° to 10° directing toward southeast, south–southeast and south–southwest. Further, the absence of mud flow/debris flow deposit together with predominance of Sp over others suggests slightly shifting nature of the braided channels. Architectural elements are the depositional units described in three dimensions. At different size scales, depositional units originate in response to processes operating over particular time scale and are physically separable from each other by a hierarchy of internal bounding surfaces. A bounding surface nomenclature encompassing six hierarchical categories has been used in this study after Miall [43, 44]. The first- and second-order bounding surfaces (Fig. 3A) were identified on the basis of micro- and meso-form dynamics, whereas style of bar migration characterizes the third-order surfaces (Fig. 3C). Fourth-order surfaces typically limit the preserved morphology of macroforms, especially the bars or architectural elements within floodplain deposits . Among the fourth-order surfaces, two different types, i.e., accretionary (4a) and erosional (4e) surfaces, could be identified following DeCelles et al. . The accretionary surface bounds the upper part of macroforms characterized by low relief and flat or convex upward geometry (Fig. 3C), while 4e surfaces relate to the erosional base of channelized body (Fig. 3B). Fifth-order bounding surfaces correspond to erosional surfaces having moderate relief depicting channel fill complexes (Fig. 3C). Lateral continuity showing relatively low relief than those enclosed in erosive fourth-order surfaces is one of the characteristic features of the fifth-order bounding surfaces. The sixth-order surfaces in the study area show relatively low relief and bound stacked channel complexes forming slightly irregular or flat erosive surfaces rather than erosive incision (Fig. 4A). Based on lithofacies distribution and arrangement of bounding surfaces, a total of five architectural elements (Fig. 5) have been identified in the deposits of the study area. 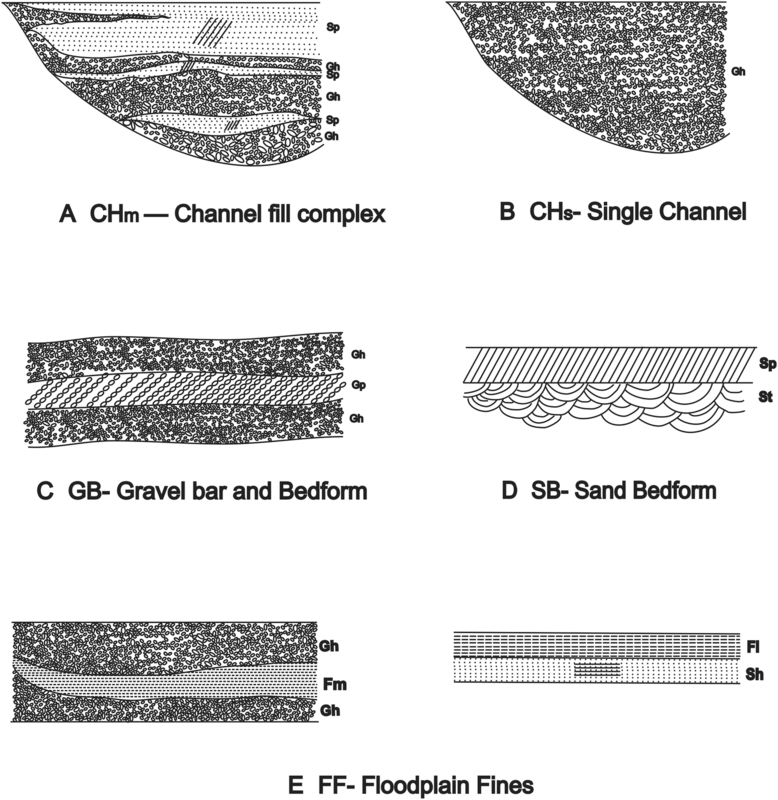 In-channel architectural elements include channel fill complex (CHm), single channel (CHs), gravel bar and bedform (GB) and sand bedform (SB). On the other hand, floodplain architectural elements are represented by floodplain fines (FF). The description and interpretation of architectural elements after Miall [42, 43, 44] are shown in Table 3. The idea that sandstone composition reflects the nature of rocks exposed in a source area, the climatic conditions and the physiographic regime in which sand was generated, forms the basic premise of tectonic provenance studies [7, 28, 32, 68, 69]. Dickinson et al. [15, 16, 17, 18] formally presented the quantitative representation of this key concept in sand provenance studies, usually referred as Dickinson model (DM). The DM consists of ternary diagrams subdivided into four provenance fields, namely continental block, magmatic arc, recycled orogen and mixed provenance, in which sub-compositions of sands can be plotted to infer their most likely plate tectonic environment. In the present context, ternary diagrams QtFL and QmFLt after Dickinson et al. were used to infer the tectonic provenance of sediments under question. The abbreviations along with normalized modal compositions used in deciphering the tectonic settings of the Dupitila sandstones are shown in Tables 4 and 5, respectively. The plot of data points in the above diagrams reflects a recycled orogen provenance especially the quartzose ones (Fig. 6A, B) for the Dupitila sediments. Based on the above observations, it may be envisaged that the basin has been receiving detritus mostly from recycled orogen provenance comprising all the three kinds of source terranes, viz. subduction complex provenance (Fig. 7), collision orogenic provenance and arc orogenic provenance. This can be further substantiated by the presence of monocrystalline quartz grains together with recycled grains (Fig. 8F), schist rock fragments, tectonized mica, sandstone and chert rock fragments (Figs. 8E, I) and a diversified suit of heavy minerals including zoned zircon crystals with inclusions (Fig. 8H). 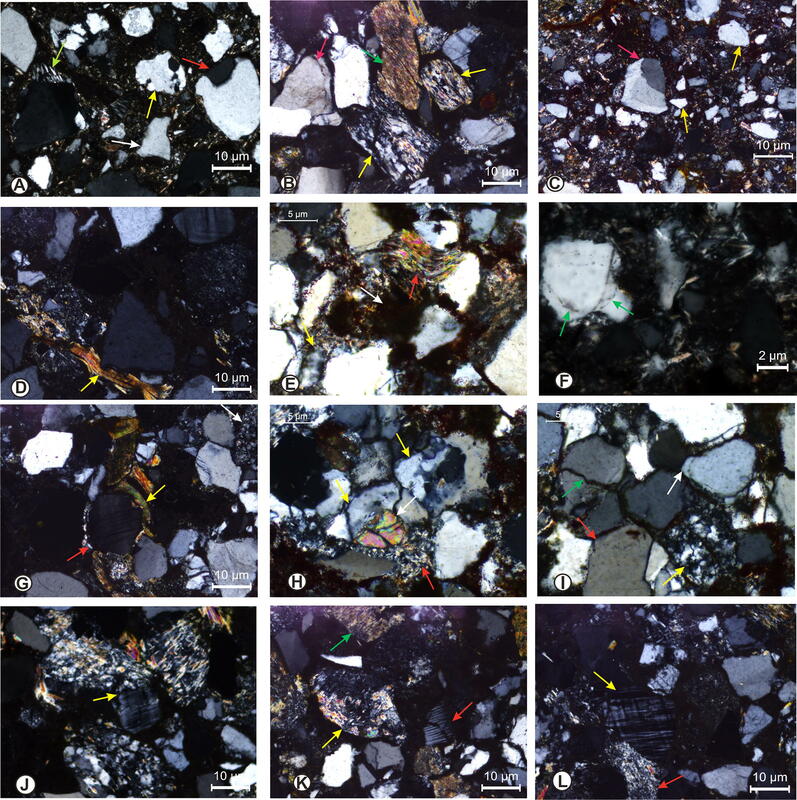 The presence of such a mixed detritus with overall fining upward sequences (Fig. 2) seems to have resulted in response to changing plate interactions through time. It is quite logical that under such unstable conditions, rocks produced in the earlier tectonic regime might have served as source rock for the detritus deposited within the new tectonic regime, resulting in Mack’s  anomalous sandstone, and hence a probable element of error in using the triangular plots of Dickinson and Suczek . The Mio-Pliocene Dupitila sandstone varies in composition from sub-litharenite to lithic arenite (Fig. 9). On the whole, these contain substantial amount of quartz (Q), subordinate feldspar (F), appreciable lithic fragments (RF) and small amounts of mica (M), matrix (Mx), cement (CT) and heavy minerals (HM), the range of modal composition being Q = 42.67–51.00, F = 3.66–8.33, RF = 12.67–19.33, M = 4.33–9.67, MX = 4.00–12.67, CT = 11.00–18.33, HM = 2.00–4.33. Most quartz grains are monocrystalline and exhibit undulatory extinction (Fig. 8I). Among the feldspar grains, K-feldspar (Fig. 8L) dominates over plagioclase feldspar (Fig. 8K). Lithic fragments are overwhelmingly metamorphic (Fig. 8B) and constitute 25–61.53% of the total rock fragments, whereas sedimentary and igneous rock fragments (Figs. 8I, K) make up only 21.64%–40.72% and 14.00%–19.33%, respectively, of the total rock fragments. Diagenetic features in Dupitila sediments comprise a series of alterations in the mineralogical composition as well as texture. These features may conveniently be grouped into early and late-stage diagenetic features (deep burial diagenesis and incipient metamorphism after ). The early diagenetic features include precipitation and deposition of silica (Fig. 8I) and epitaxial growth of mica (phyllomorphic stage of diagenesis) around detrital feldspar grains (Fig. 8G). Silica overgrowths are conspicuously less developed where quartz grains are held together by sericitic matrix (Fig. 8A). It appears that clay matrix has acted as a barrier for the silica solution to reach the quartz grains and form secondary overgrowths . Association of quartz overgrowth and authigenic clays has been followed by iron-oxide precipitation signifying the typical order of cementation . At places, near complete replacement of quartz by matrix has resulted into corroded quartz boundaries (Fig. 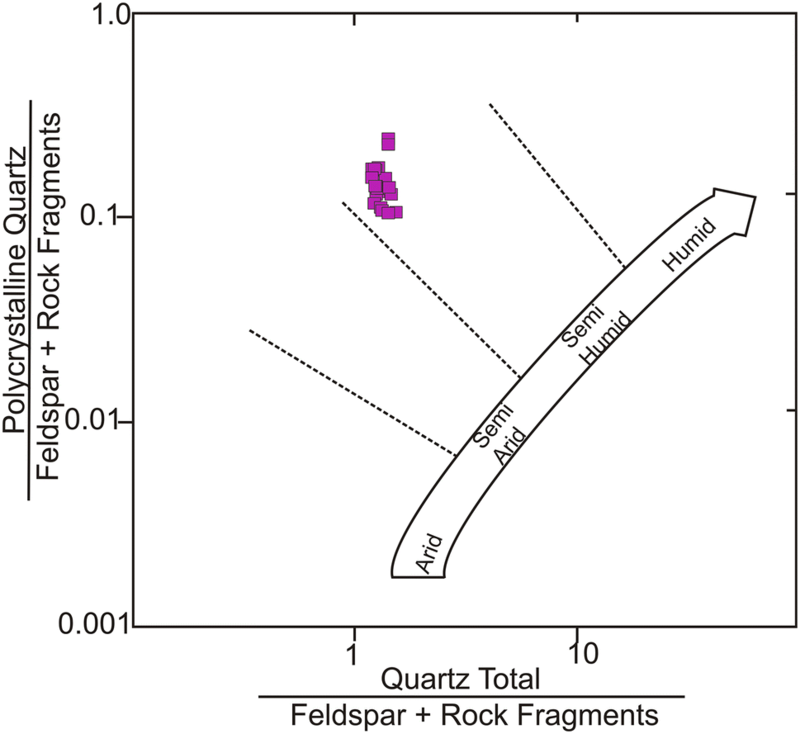 8A) leading to development of “quartz islands.” Alteration of feldspar grains and associated pseudo-matrix (Fig. 8J) signifies post-depositional degradation of feldspars. 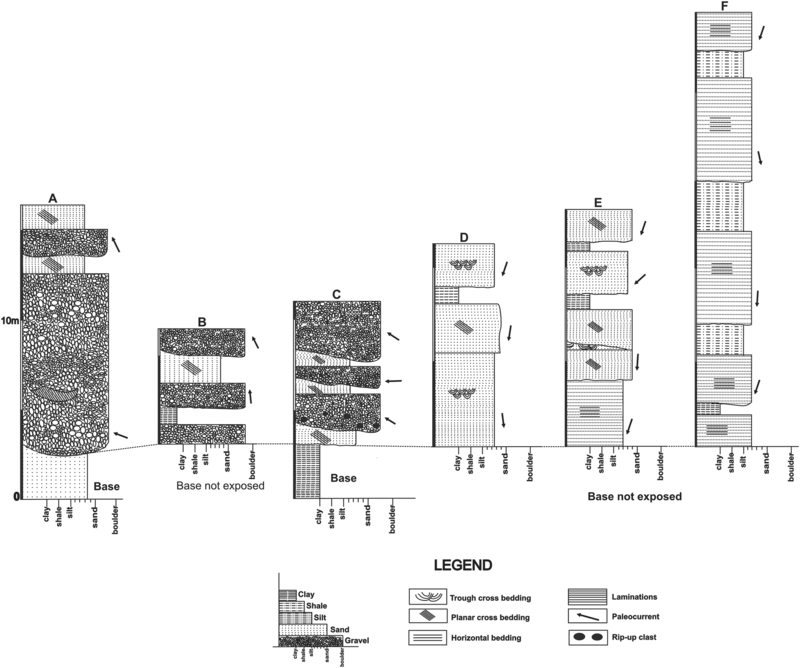 The presence of reconstituted detrital clay–chert matrix (Fig. 8G) may be attributed to neomorphic growth during deep burial diagenesis. Diagenetic features like fracturing, crushing and squashing of the detritus grains (Fig. 8I) reflect increasing depth of burial . Dissolution of clastic grains along their contacts due to the effect of pressure solution has caused modification of grain contacts from tangential to concavo-convex through long contacts. In addition, other signatures of deep burial diagenesis in the sediments of the study area include recrystallization and reconstitution of matrix (Fig. 8H), kink bending in mica flakes (Fig. 8D) and extensive corrosive reaction between quartz and matrix (Fig. 8A). The siliciclastic modes and petrographic observations presented above are in good accordance with the inferences drawn in favor of a recycled orogen provenance. Allen et al. , while working in the Myanmar side of IBR, drew almost similar conclusions. Based on the 39Ar–40Ar and U–Pb data for detritus white micas and zircon grains, they have opined that the tertiary sediments in parts of the IBR represent erosion from the metamorphosed core and un-metamorphosed cover of the Himalaya, the contributions from the latter being more significant late Paleogene onward. As we know that the recycled orogen provenances comprise subduction complexes, collision complexes and foreland uplift complexes in which collision complexes represent sequences present along and near the preceding continental margins prior to their juxtaposition along a suture belt. Associated with the terrain, there would be ophiolitic melanges and structurally dislocated plutonic terrain of basement blocks &/or magmatic arcs involved in the crustal collision. The collision-derived sediments are mainly shed longitudinally from the evolving orogen into the closing remnant basins (here Bengal basin) as turbidites [17, 19]. All the seven lithofacies and the five architectural elements [52, 65] when viewed in conjugation with the tectonic provenance depict deposition of Dupitila Formation in gravelly and sandy braided streams under the influence of source area tectonics . Among gravelly facies, the presence of Gh lithofacies indicates high-energy tractive deposition in a relatively shallow depth, whereas lithofacies Gp point towards sudden jump in the hydraulic condition leading to formation of planar cross-stratification. The presence of cobble–pebble and granule size particles in Gh and Gp (proximal fan) coupled with sand-dominated facies, i.e., St, Sp and Sh alternations, testifies distal end of a braided river system [41, 60]. Owing to fine and coarse-grained nature coupled with preservation of large-scale trough cross-stratification, the St facies has been attributed to migration of 3-D dunes, whereas Sp facies records migration of 2 D dunes. Both the lithofacies, i.e., St and Sp, favor deposition under a relatively high water level compared to Sh which seems to have been deposited under upper flow regime condition. In addition to gravelly and sandy facies, two more relatively finer-grained lithofacies, i.e., Fl and Fm, were recorded. They exhibit plane laminations and contain partly carbonized plant roots. Laterally, these fine-grained lithofacies associate themselves with the distal fan facies (St, Sp & Sh). These two lithofacies have been attributed to overbank floodplain deposits. Though meager, their intercalation with gravelly and sandy facies is remarkable. These lithofacies and their gravel–sand and sand–mud associations when viewed in 3-D define unique geometrical patterns separated by well-defined bounding surfaces . Among five architectural elements identified, the in-channel  components include CHs, CHm, GB and SB, whereas FF represents floodplain fines [19, 44]. The presence of alternating gravelly and sandy facies characterizes channel complexes. These alternations are in turn succeeded by the floodplain fines presenting an overall thinning and fining upward cycle in which Sp and St are the dominant components. Downstream, the sandy and overbank facies ultimately take over the gravelly facies. 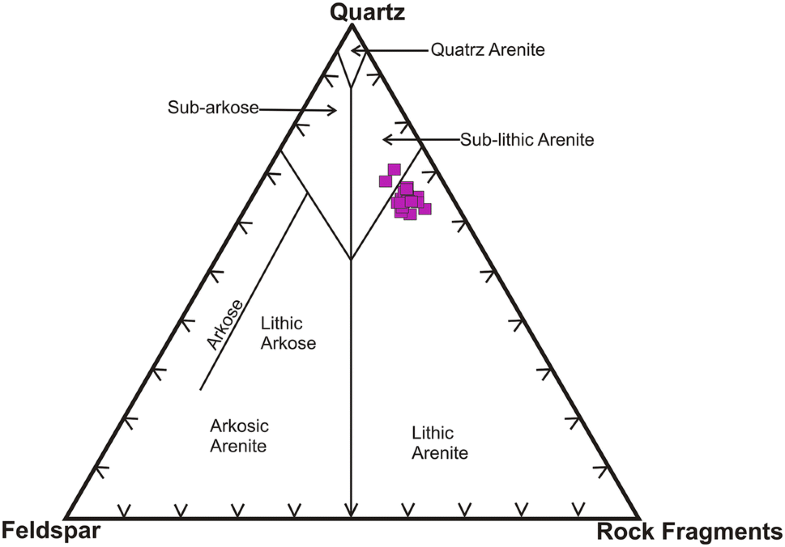 The lithic to sub-lithic Dupitila arenites are dominated by sub-angular to sub-rounded undulatory quartz, physillites, chert, sandstone, quartzite, granite, gneiss and slightly decomposed feldspar fragments depicting post-orogenic terrestrial accumulation  under the influence of semi-humid climatic condition  (Fig. 7). Such a diversified detritus delivery seems to have been made largely by the Shillong massif  and to a lesser degree by the eastern Himalaya. The southern margin of Shillong plateau is marked by Dauki fault—an active fault defining the basin margin for Dupitila sedimentation . Further, Shillong plateau has been considered as a detached block of the Indian Plate that has displaced laterally for about 250 km along Dauki fault . A vertical upliftment of Shillong plateau has also been envisaged by workers like Desikachar , Das Gupta  and Rao . Hiller and Elahi  while dealing with Sylhet trough noted that the Dupitilas (2393 m) and to a much lesser degree Tipams each thin over anticlinal crest indicating that they were deposited synchronously with folding. Further, occurrences of angular unconformity near the anticlines and conformable contacts in synclines testify the above observation. The fluvial deposits for Dupitila Formation consist of seven lithofacies which include clast-supported horizontally stratified gravel facies (Gh), matrix-supported planar cross-bedded gravel facies (Gp), trough cross-bedded sandstone facies (St), planar cross-bedded sandstone facies (Sp), horizontally bedded sandstone facies (Sh), laminated sand–silt–mud facies (Fl) and massive mud facies (Fm) characterizing a gravelly braided river system with distal finer elements of sand and mud. There are two lithofacies associations that characterize the lower and upper Dupitila succession, i.e., interbedded gravel–sand and sand–mud associations, respectively. In the Dupitila Formation, five architectural elements include channel fill complex (CHm), single channel (CHs), gravel bar and bedform (GB), sand bedforms (SB) and floodplain fines (FF) separated by first- to sixth-order bounding surfaces after Miall . The diversified detritus delivery to the basin was made largely by the recycled orogen provenance comprising Shillong massif, the eastern Himalaya and the IBR under the influence of semi-humid climatic condition. Sediment supply kept pace with tectonism at the time of deposition of Dupitila sediments, and enhancement in source area relief is predicted on the basis of lateral distribution of gravel and sand. The presence of angular unconformity near the anticlines and conformable contact in the synclines support the idea of sedimentation during folding events due to thrust sheet loading especially from IBR side . The authors are thankful to the Department of Earth Science, Assam University, Silchar, for providing necessary facilities for carrying out the research work successfully. Thanks are also due to the Regional laboratory, ONGC, Sivasagar, Assam, for the necessary help during the preparation of thin sections. Authors are deeply grateful to the reviewers for their help in improving this article.